Our website draws 2.9 million visitors per month. 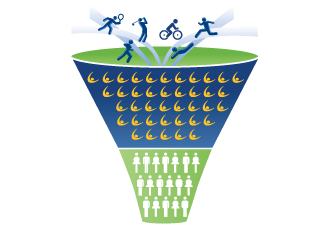 We also send event information (like e-newsletters) to our subscriber base of over 6 million active consumers, half of which are endurance sport enthusiasts. Your event will appear in our searchable calendar, in our e-newsletters and in our “Events You Might Be Interested In” website feature. Millions of new participants will see your event, in a multitude of locations. When you team up with Active Network, Endurance, your web search power will expand through the strength of our SEO. Over 475,000 Active searches are performed each month and Google consistently ranks Active events within the top search results. That means you will have more web “real estate”. Your website as well as your Active event listing will appear on any internet search results for your event—and both will be pointing towards registration. 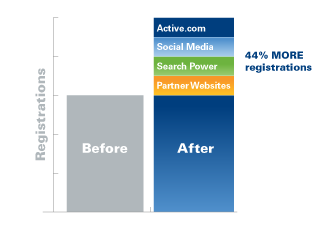 Active’s social media network size was nearly 180,000 members at the end of February 2010. We have recently focused our efforts on social media and have been growing by almost 50,000 fans and followers a month. We engage our members on a daily basis with informative articles, training tips, event information and more. How does this benefit you? Each posting links back to Active.com, where your event listing lives. 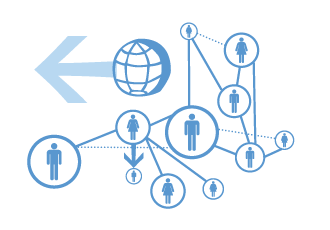 Our social networks push the opportunity for even more registrations your way. Active has made alliances with several well-known industry players, including Livestrong.com, lifeintheusa.com, mapmyrun.com, and almightyboston.com. We have built event “feeds” to transmit our event listings over to our partner websites. Your event will appear when visitors perform searches on these websites, expanding your reach even further as you benefit from the web traffic and notoriety of our partners.